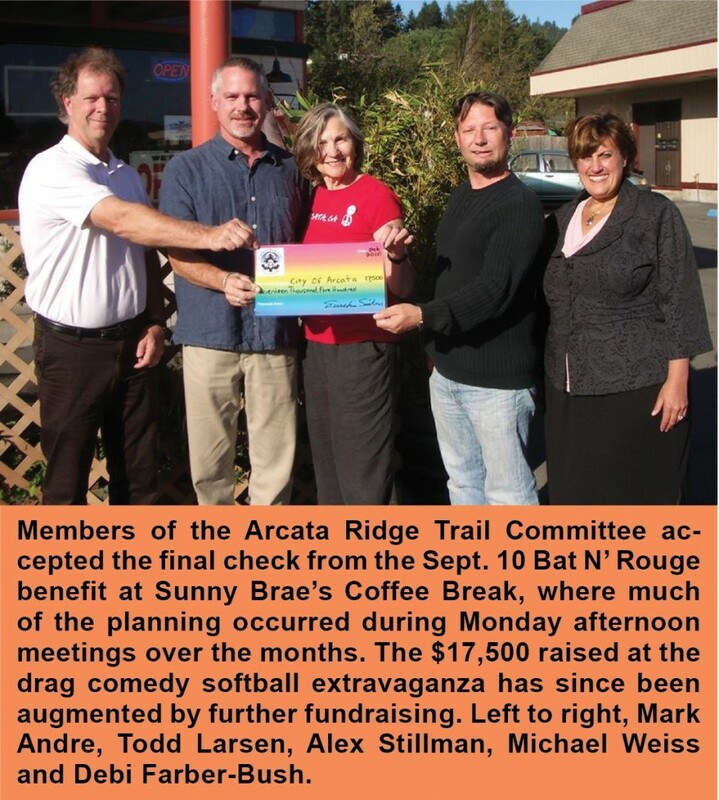 Members of the Arcata Ridge Trail Committee accepted the final check from the Sept. 10 Bat N’ Rouge benefit at Sunny Brae’s Coffee Break, where much of the planning occurred during Monday afternoon meetings over the months. The $17,500 raised at the drag comedy softball extravaganza has since been augmented by further fundraising. Left to right, Mark Andre, Todd Larsen, Alex Stillman, Michael Weiss and Debi Farber-Bush. ARCATA – Those whose interest in Arcata’s woodlands, parks and open spaces has been piqued by the recent surge in forest activism have some interesting choices for public meetings to attend this Thursday, Oct. 14. At 4 p.m., the Forest Management Committee (FMC) meets in Council Chamber at City Hall, then makes a field trip to this summer’s timber harvest sites. The committee routinely conducts post-harvest inspections to ascertain impacts and refine its decisionmaking for future harvests. At 6 p.m., the FMC will be back in Council Chamber along with Open Space & Agriculture, Wetlands & Creeks and Parks & Recreation committees for a big joint session. Common areas of interest will be discussed, including the Arcata Ridge Trail, property acquisitions, the Forest Fund, Rotary and Redwood parks, Janes Creek/West End Road, Arcata Marsh and Wildlife Center expansion, Land Use Code Revisions, forest projects, timber harvest results, the Humboldt County General Plan Update and public comment. This entry was posted on Tuesday, October 12th, 2010 at 10:02 am	and is filed under News, Environment. You can follow any responses to this entry through the RSS 2.0 feed.